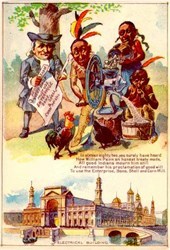 Beautifully printed tradecard designed and published by the Enterprise Manufacturing Company around 1893. This beautiful tradecard has an comic image of indians using a corn mill and the Electrical Building from the World's Fair and is over 108 years old. Below the the imaage of the indians it says" In sixteen eighty two, you surely have heard How william Penn an honest treaty made. All good Indians mourn him still And remember his proclamation of goodwill. 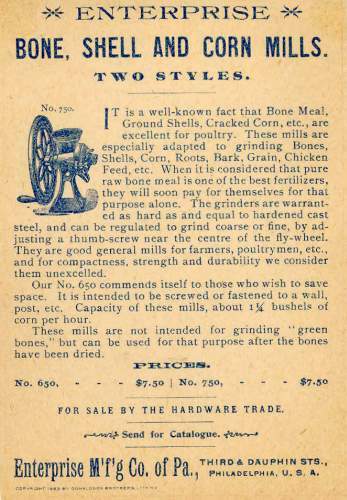 To use the Enterprise Bone, Shell and Corn Mill."